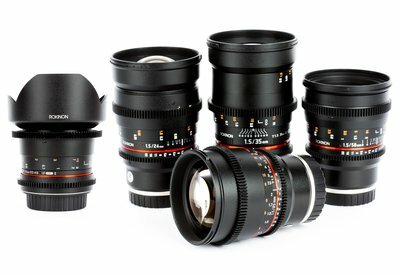 This kit is for the Canon EF mount 14mm, 24mm, 35mm, 50mm, and 85mm awesome yet affordable cinema lenses from Rokinon. All of these lenses open up to T1.5 (except the 14mm which opens to T3.1) and have geared aperture and focus rings. A smooth iris means clean iris pulls without the "clicking" of 1/3 stops. Rokinon's DS line features full-frame coverage, sharper images, less chromatic aberrations, and reduced lens flare.